Oh boy. The folks at Massdrop have gone and done it again. Just got their new Massdrop x HiFiMAN HE4XX in for measurements and a quick listen before the drop. 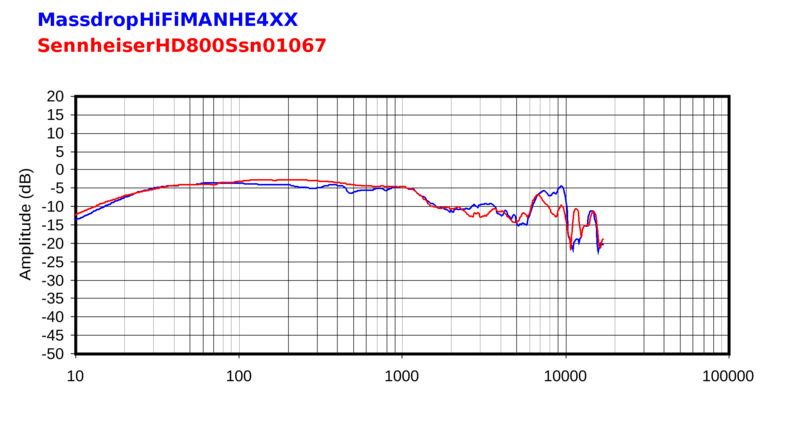 There seems to be a little curiosity on the forums about from which HE400 varient the HE4XX descends. By the look of the measurements (HE4XX and HE400i) I think it most resembles the HE400i. They have changed a few things: there's a new, much better headband; they've used the lauded Focus-A pads; it's liveried now in a cool midnight-blue colorway soft-touch matte finish; and most importantly, the price has been pushed down to an astonishing $169! I guess the only thing to note is they aren't as efficient as the Massdrop copy makes them sound; they play loud enough on a smartphone, but just barely. I gushed in my HE400S review, in some ways I preferred it over the HD 600. Comparing the HE4XX to the HD 600 again today I've got to say I still think it's better in some ways. The HD 600 is smoother and more liquid sounding, but it's got that veil, and the long hump in the bass/lower-mids response does give it a thick coloration compared to the HE4XX. Treble is a bit more strident in the HE4XX, and the presence area is a little more withdrawn, but bass extension and midrange neutrality are better than the HD 600. Bottom line: both are very good cans. But that price difference! People should be yelling, "Take my money!" I've also noted folks wondering about the Monoprice Monolith M1060 planar magnetic that goes for $299 and how it compares. As luck would have it, headphone enthusiast PockyG sent his pair in for measurements. Looks pretty good. Listening in comparison, I found the M1060 more forward and strident, though with better bass. The HE4XX pretty easily sounded more refined; it's the better headphone to my ears. The HE4XX drop starts tomorrow. Not sure of the total numbers planned, but if I was a budding headphone headphone enthusiast looking for their first pair of killer cans I'd jump on this. It's a no brainer. Enjoy! These look surprisingly similar to HD800S. A bit less thicc, which is nice. A bit more upper mids, which is nice. A bunch more treble though, which might deter some people. $169? Seems pretty good honestly. When I reviewed the stock M1060 it was the first planar where the ringing is so extreme that I could hear the ortho wall being excited. Bell-like weird tones would occur occasionally while listening to that thing. Explains the extremely bizarre discontinuous 4-5k feature. Also has massive distortion throughout. Will be interesting to see the improvement if you measure a modified 1060 pair, Tyll. A lot of people have been modding them to supposedly excellent results. I've owned the HD600 cans for a long time, got a new set from Sennheiser last year when my old ones broke (out of warranty). I bought the HE-400i phones last winter and found them to be rather piercing and congested in the midrange, even after running them for a couple hundred hours as a break-in. But once I replaced the stock pads with the Focus PadsA, that midrange stridency went away, and now I really like them-=-I still find the Senns to have a little more "airiness" around the performers (I listen almost exclusively to classical). A defect of the HE-400i phones is the short, stiff cord. I haven't tried other cables to see if they change the SQ, but the stock cable is just way too short. And it requires more power than I get from my iPhone, so I leave it at home and travel with something else. Tyll, thanks for this information, great post ! Thanks for the review, Tyll! How would you compare the HE-4XX with the AKG K7XX, since they're at a similar price point? Thinking perhaps I will use them as an alternative/supplament to the PM-3's I travel with. I noticed they won't be shipped until mid December. Massdrop is bucking our instant gratification consumer culture! I'm a little confused. You said (and demonstrated pretty convincingly via measurements) that the HE4XX is most similar to the HE400i, yet you went on to talk about the HE400S, which according to measurements is noticeably different (less bass and treble) to the HE400i. That's because Tyll never reviewed the 400i, only the 400s. He did however measured the 400i and is comment was based on these measurments. As for bringing the 400s it was just to say that in the past he thought that the 400s were even greater than it's Senn's hd600 which is a reference for a lot of people, and he is saying now the the 4XX also in some ways trump the Senns but he didn't say both Hifiman sounds the same. That's how I read it. How will these compare to the Fostex T-X0? It seems another early sample making the rounds had the regular Focus pads on them, rather than the Focus A (different perforations on the inside of the pads). Can you confirm that the ones you got have the Focus A pads as advertised on the Massdrop site? Isn't it time to learn something of the way recent incidents happened? Why does Tyll let himself be drawn into the marketing and sales activities/campaign of non-caring and money addicted Massdrop? Why is he actively confusing people with an unclear 'much too early' review, hiding some important facts about differences to the 'normal' model? I thought the Focal desaster and the completely gone wrong description of the AEON pre-production model's sound signature would have caused some changes. I for one will not buy this headphone until the first real production units are shipped. And if it is not possible to buy it then any more - so be it. I don't think you should see that as a review. Those are his early impressions, he speaks in general term of the value offered. Now, what units are the manufacturers supposed to send to reviewers if it's not the early run ones? The Idea is that when the product is out and available the buyer can research reviews and read about the product. Is there a small chance that some tweaks are to be performed afterward? Indeed it can happen but if the manufacturer sends it to reviewers we should assume that they feel it's ready enough. Normally they won't tweak them for worse. Now if your concern is more based on quality control, meaning that what is sent out there don't perform all the same or a particular batch has a problem, then no reviewer on earth will be able to safely avoid that. He will always review the unit he has on hand. Tyll did on the cases you mentioned made the thorough job of investigating and making sure his reviews are inline with what people are getting. That's awesome to follow up like that when we are talking four digits (OK less for Aeon but I didn't follow too much the controversy you refer to), but I can't see reviewers for the sub 200$ headphones market go and wait to have listened and measured 5 pairs produced from 3 different batches and to finally have the right to give his tought on how it sounds. I personally find this early review important, you are allowed to not trust them until a mass of people have given their thought on it, it's a valid choice. But I think that implying that he is "confusing people" than that it's "time to learn" is a bit strong of a statement. A lot of people find this helpful. It makes sense it's the job of a reviewer to do just that. Talk about what he heard not go with what if in the end shitapunz and the customers don't get that. Life's too short for that. This impression is useful before the Drop, not after because that's when people are actually buying. Is it part of a marketing campaign to send review samples? Sure it is, but that's what headphone manufacturers do, sell headphones, without marketing they don't sell any and eventually they stop making them. Call it being non-caring and money addicted if it's what you feel but the fact remain that Massdrop collab productions have given us great headphones so far, at a great price. Now. You don't have to buy them. Great review, I have to say tough, wondering if there is a particular reason why it seams that there are never any Beyerdynamics reviews in Innerfidelity. Thought of that today because the 770 is certainly considered a good performer in the sub 200$ sealed over-ear. I never heard them so it's really not about what's the better but I do know that generally speaking Beyerdynamics are top notch in their construction, and also praised by many. We could also argue that they are a major player in headphones having been there forever and having some notoriety. I'm I right to think that they're very under represented in Innerfidelity? Just you don't like them? Or they refuse to send their HP for reviews? Just curious because we do come here to compare the options, to help us decide on the great values, we read the wall of fame and we know your reviews are unbiased but still representing only certain brands is some form of bias but maybe there's nothing you can do about it. Just curious. My bad, meant to write that in the HD569 review comments which would have been more relevant but my question remain. I recall some negative comments about early Tesla models but I don't think there was a review, pretty sure he did review one or two of their sturdy on ears (DT-13xx, T-51) tho as well as one of their cheaper models. Those last two would be within the last 2 years or so... Beyer's build quality is definitely right up there w/V-moda, same kinda mix of metal and thick plastic. I dunno that their latest stuff has been as consistent as their classic models tho, granted that's a broad generalisation but it's the impression I get when they come up elsewhere. Had a pair of DT-880s 250ohm at one point myself. Not surprised to see a Massdrop for headphones based on the 400i. The 400i have been reduced in price substantially since they were introduced. I think I paid $250 for mine a couple of years ago, and they are still my main pair. It's really awesome seeing value products that provide a great listening experience at the same time that we see prices for high end items skyrocketing. Received my Massdrop HiFiMAN HE4XXs today (regional Queensland, Australia), ordered on December 11th. I spent an hour with HE400Ss in a headphone store some years ago in view to replacing my woolly sounding HD-650s (and had the Sennheiser HD-600s for a decade before that). Closed miked solo piano was (to me) listenable (the bass notes hangover simply could not be EQed out). 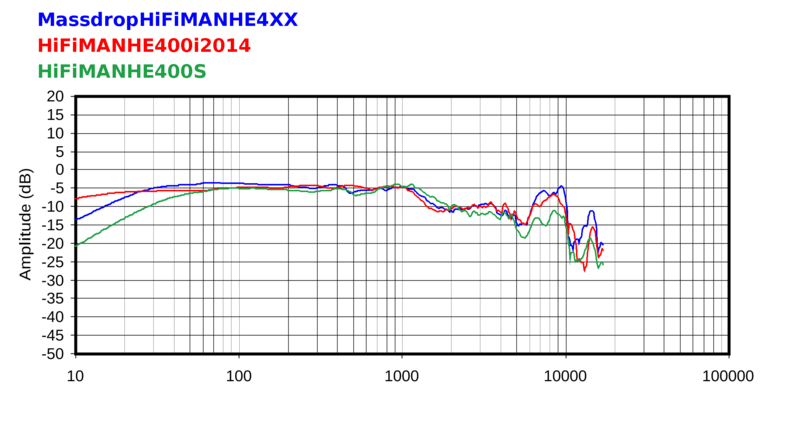 The HD400Ss failed the test due to - what appeared a that time - "one-note" bass sound. Perhaps my decades-long infatuation with the HD-6X0s had biased my hearing. Tyll had already warned me about the Superlux's scissor-like treble so I was prepared for it (tho I didn't find it as bad as he did) and with a bit of EQ it was my "final" (or so I thought) headphone to see my audiophile days out for the next decade or so. Its bass was tight. Compared to the HD-6X0s, super tight! THe HD668Bs solved my fixation with Lots Of Tight, Deep Bass (I listen to plenty of American Top 40, not just solo piano). The HE4XXs were today plugged straight into my iPhone (my "reference" standard) source and "Abbey Road". Tight bass! Bass not as dry as the Superlux, and its treble felt a little dark (same impression as I always got when I first put on either of my HD-6X0s). But the Superlux even with EQ could shriek sometimes. The HE4XXs are certainly not going to. I have had MANY headphones over the decades, with the HE4XXs, I couldn't be more satisfied. Plus both Left and Right side transducers worked out of the box (unlike some unfortunate buyers). Thanks Massdrop for this release. And thanks to Innerfidelity for all the work helping keep headphone manufacturers..... honest. Funny you say new headband because that's the older HE400's headband!